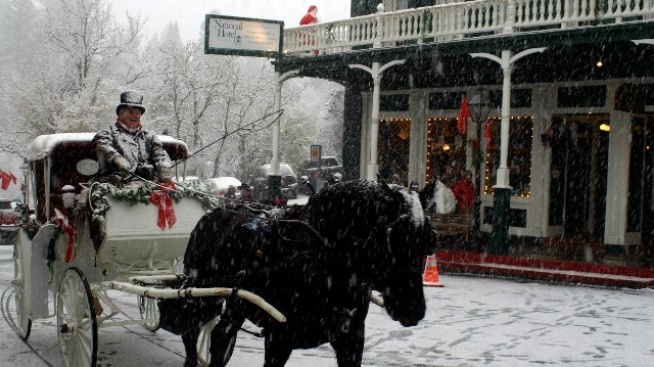 Snack on chestnuts, listen to carolers, and soak up the quaint-a-tude in the historic Sierra foothills hamlet. It isn't just a day, or night, no sirree: This holiday tradition pops up over a number of December afternoons and evenings, as it will again, in 2018. VICTORIAN CHRISTMAS, and it has been charming-up the already charmed-out hamlet for several years. Nope, not everyone dresses up, but some people do, and you can count on seeing carolers or other performers who appear to have stepped off the top of a Currier & Ives tin. Look also for the "authentic gas lamps" and chestnuts of the roasted variety to round out the pretty picture. Plenty of other booths and stops, some with dolls, art, food, and more, fill out the long and lots-to-look-at walk along Broad Street, through the heart of the historic town. ONE OF THE NICEST PARTS? This isn't a one-day-only lark, nor a weekend-long whimsy. It pops up, as mentioned, during the mid-week, twice, and on three December Sundays, beginning on Dec. 9 in 2018. That means that even if your yuletide season is as overloaded as a crumpet sitting under a heap of jam, you might be able to find one clear Wednesday or Sunday to visit this Sierra hamlet. Note that Victorian Christmas isn't happening on every Wednesday and Sunday during the month, but a bunch of them, so get planning now, top hat-wearing, monocle-rocking Victorianists of the modern age.